29/02/2008 – UPDATE: It’s official that this has to be the most popular post I’ve ever written. I’m getting visits into the 100’s daily and mostly landing at this page. But the reason for this update is that it’s come to my attention that some readers are being misled into thinking that the dead/murdered/killed/terminated/aborted baby in the second picture is Kimberly Mueller. I did not state this- in fact I provided a link to the news report that stated baby Kimberley was born the worlds smallest surviving baby. In actual fact Kimberly Mueller is alive and well growing up with her ‘wanted’ parents. Please note that my reference to the familiarity of the image was to draw an inference between the two, that the second child was not only alive but had every possibility of health and life ahead of it, and was at a similar age to baby Kimberley before being made dead. It’s startling, upsetting and sadly a reality, I don’t make apologies for this. I truly hope that perhaps someone considering an abortion in the second trimester would find this post and be put off. I would hope they consider adoption, or even the fact that their own mother gave them chance. I don’t believe these children are unwanted (by God, by childless couples, by the church or people of compassion), but I do believe for every ‘abortion’ there is an unwanted mother. 36. That’s the number of weeks, roughly, that it takes for a pregnancy to come to full term. 24. That’s the number of weeks (in the UK) that an abortion can be legally carried out up to. 12. That’s the ‘safety zone’, the number of weeks between 24 and 36 for a growing fetus/unborn child. 15. That’s the number of weeks that baby Kimberly Mueller was born prematurely (that makes her 21 weeks old as a fetus/child). 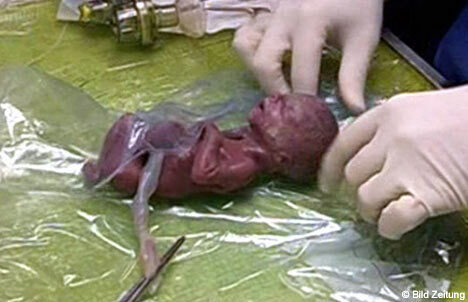 If baby Kimberly was killed terminated now, it would not be called ‘termination’, it would be called murder. I think I’ve finally figured out how to stay safe and avoid getting murdered. Ask yourself the question: Could ‘Bob next door’ be serial killer? You may never have asked this question before but I am about to reveal a truth to you, pay attention, be warned! Every now and then you see these stories in the papers or on the TV. Serial killing family with 30 bodies discovered under their patio, or serial killer who brought people back to his apartment before butchering them finally caught after 15 years. Have you noticed they always interview the neighbour’s? And the story is always the same, “he was a nice man, never bothered anyone, quiet, kept himself to himself”. See, it’s not the crazy stalker folk you have to avoid. It’s the quiet neighbour’s who are the real threat. Those friendly neighbour’s who don’t make too much noise, always respect your property/boundaries, obey the law etc… If you have a neighbour like this I suggest you start planning to move, don’t leave a forwarding address, just get out of there right now! If you can’t, at least have a relative call or check in on you everyday at the same time.